Situated in a nicely landscaped, mature neighborhood with lots of trees, residents of Bridge Street have all they could ask for in terms of location as they enjoy the rich character of their home and its surroundings. 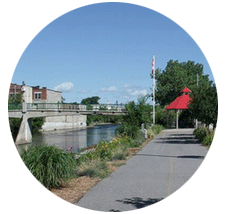 Just a short stroll from downtown Belleville’s historic district, residents have easy access to the many amenities of downtown including banks, pharmacies, churches, parks, museums, art galleries, shops and municipal offices. For those who wish to venture further, the Quinte Mall, golf courses, and the Bay of Quinte lie just a short drive away and are all served by Belleville transit which stops directly in front of the building.